Thomas Kast sent SPACE.com this photo of a lunar fog bow taken over a lake in Yli-Ii, Finland on Aug. 25. The ethereal light of a lunar fog bow made of moonlight and fog glows over a Finland lake in this beautiful night sky photo. Finnish photographer Thomas Kast took this stunning shot on a cold, foggy night around 1 a.m. local time on Aug. 25, from Yli-Ii, Finland. Similar to a rainbow, tiny water droplets that cause fog reflect light. 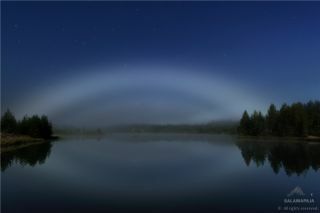 Lunar fog bows typically appear white because sunlight reflected from the moon is weak. Some photographers have also captured so-called "moonbows," which are similar to rainbows in that they do include colors. The lunar fog bows lack of colors is caused by the smaller water drops … so small that the wavelength of light becomes important. Diffraction smears out colors that would be created by larger water drops in rainbows, according to NASA.